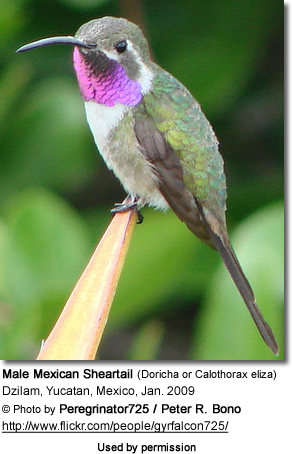 The Typical Sheartails (Doricha) is a Mexican hummingbird genus that is named for their deeply forked, narrow tail. 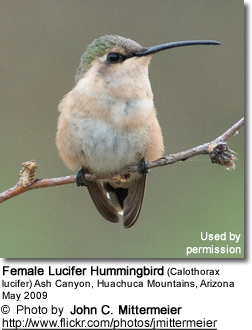 Lucifer Hummingbirds (Calothorax lucifer) - Found in central and northern Mexico with vagrants in southeast Arizona, southwest New Mexico and west Texas. Mexican Sheartail (Doricha eliza or Calothorax eliza) - Found In southeastern Mexico; specifically, Yucatán and Veracruz. The Sheartail's bill is long and slightly down-curved. The back is grey-green. The forked tail folds to a narrow point. They have short wings.. The male of either subspecies has a long, purple / magenta throat patch that is elongated at the sides. This throat patch (known as "gorget" appears black in poor light. The female has a buffy chest. The female Sheartails is responsible for building the cup-shaped nest out of plant fibers woven together and green moss on the outside for camouflage in a protected location in a shrub, bush or tree. She lines the nest with soft plant fibers, animal hair and feather down, and strengthens the structure with spider webbing and other sticky material, giving it an elastic quality to allow it to stretch to double its size as the chicks grow and need more room. The nest is typically found on a low, thin horizontal branch. The Sheartails primarily feed on nectar taken from a variety of brightly colored, scented small flowers of trees, herbs, shrubs and epiphytes. They favor flowers with the highest sugar content (often red-colored and tubular-shaped) and seek out, and aggressively protect, those areas containing flowers with high energy nectar.They use their long, extendible, straw-like tongues to retrieve the nectar while hovering with their tails cocked upward as they are licking at the nectar up to 13 times per second. Sometimes they may be seen hanging on the flower while feeding.